The Moon Festival slots is inspired by one of the many festivities celebrated by a certain part of the eastern population, as it is being talked about The Moon Festival, also known as the Mid-Autumn Festival which is one of the most popular traditional festivals in China, Christmas is a festivity that is as important to the population of the West as it is to their culture. This Festival of the Moon has a very extensive history and different legends, its origins have been extended throughout the generations, for this celebration multiple poems are prepared to refer to this special day and the famous yuebing or better known as the divine moon cakes. The closest family and friends prepare the day to spend together and admire the moon while they eat and recite the poems. For the Chinese population, the moon is a symbol that represents prosperity, love, and peace; therefore it is extremely important and must-see. If you want to celebrate it too, you can be sure that the Chinese will not care. It is a festival that has been mentioned in many oriental films; surely the players have seen at least one of them. 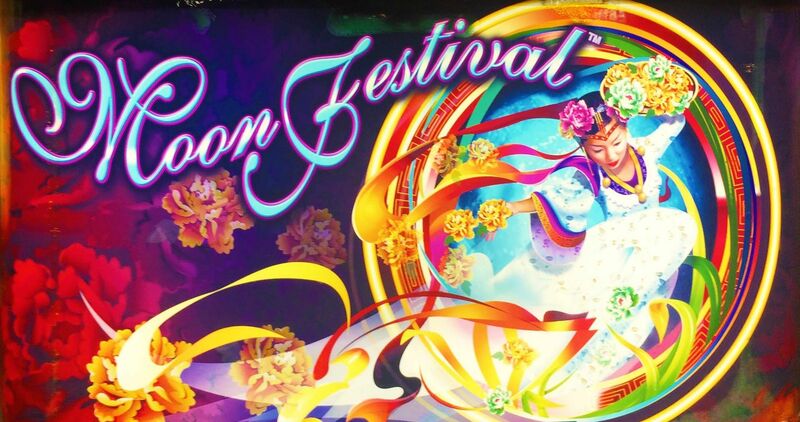 The Aristocrat Gaming team was inspired by this beautiful festival and wanted to create the slots that would later be called Moon Festival. This slot machine gained a lot of fame, the players were interested in the different thing and without a doubt interesting that it could be the Chinese culture, the tasty moon cakes, and the creative poems. However, they were hooked by their wild sticky graphics, in addition to their modest 50s pay lines and free spins bonuses that are obtained once three lantern graphics fall in only three of the five reels that are seen on the screen; without forgetting that this same combination of scattering lanterns helps the player obtain a multiplier to the final bet. The player will receive up to ten free spins to start, once inside these free spins, if any wild graph represented by the moon comes down, it can take the place of the other graphs in order to win the user; that’s when the sticky characteristic will be activated and the wild moon will not move from its place until the free rounds come to an end. As long as the wild moon remains sticky, the player will have the opportunity to receive five additional turns if the red lantern scatters falls below some wild moon. This feature is also seen in other slot games like Miss Kitty, also from Aristocrat Gaming. In this unique and historical festival players opt for up to fifty pay lines in which each of them has the opportunity to make fairly flexible bets ranging from 0.25 credits to 10 credits. The bets in their entirety can vary from 12.5 credits to 500 credits per round, a notoriously larger range of bets than other betting machines; this being something good that they have to know how to play in their favor because in the end the gains can be easily multiplied. Obviously, these gains result if the player is playing and betting with real money; all these winnings and prizes are not possible to obtain if you play a free version online. The player must bet real money and think about how much he will be willing to spend; because this slot game presents great opportunities to win fairly large sums of money, the odds of winning more are maximized if the player is in the ability to bet more, of course. In addition to having great flexibility in the manageable amount of bets, players of any kind can easily approach this betting machine. It is quite fascinating to see the machine approach and spend a pleasant time, from great players with unlimited budgets to beginner’s players a bit cut out of money. On the screen, you can see an auto spin button that will allow the player to sit down, relax while watching the slot machine work alone during the twenty-five turns until they are finished and show a spectacular victory or on the contrary, a sad defeat. In this Moon Festival slot game, poker card graphics are not commonly considered to be of lesser value or simply discarded, as in other cases. Well, these poker cards at Moon Festival have a good number of winnings available to win. This is because there is an incredibly modest population of Chinese who enjoy playing this card game, therefore Aristocrat Gaming gave some importance to these graphics also because in one way or another it is related to the oriental theme. The player will be able to obtain the prizes if they arrive to fall from three to five graphs of the same type. How much do you get per type of letter? For all of them, from the kings, jackals, aces, queens and the nine, give a multiplier prize that goes from five to fifty times the bet per pay line. Other graphics represent luck as a very adorable rabbit and there is also a place for the beautiful pink lotus flowers, instead, the mooncakes and the charming banjo are implemented to celebrate this festivity while reciting the poems with a little musical company; these are graphs that also grant bonuses of at least seventy-five times the payment line. In this slot, the graph with the most power is the little girl who is dressed in what appears to be a kimono, a traditional Chinese suit. This girl can make you win up to a hundred times the bet per line. The Aristocrat team does not fail to obtain the best sources of inspiration, because it took this beautiful Chinese holiday and made it a very entertaining and different betting game. He grabbed the most important and representative of this Festival of the Moon, traditional graphics highlighting very well. The creativity in implementing sticky wild graphics presents an extra fun and makes you think maybe more of the count in moon cakes and how sticky these could be too. The characteristics of this slot machine make it highly powerful, since the gains and bonuses could be very high and of high quality. There is a fairly large population that takes great importance to the visual quality of a game, whether slot machines or not. Well, visually speaking the screen has an almost magical and fanciful design, in the background, you can see a lot of red flowers, in addition to mainly oriental graphics and sound effects, of course. The game has an RTP (return to player/return to the player) of 94.76%, which is quite high and extremely surprising, it should be noted that not all slot games have a percentage like that. This game can be enjoyed online for free in the virtual casinos preferred by the players. It also shows to be compatible with state-of-the-art smartphones. However, take into account that to acquire real gains, you have to bet real money. If you are a player looking for new experiences and adventures where you can learn and enjoy other cultures and styles of seeing life, Moon Festival is the ideal choice.